Choosing roof materials is like a great hairdo because your roof plays a big role in the overall style and quality of your home. If you are deciding which roof to install on a new home or are replacing your present one, here’s how you can achieve beautiful curb appeal and functionality while staying within budget. 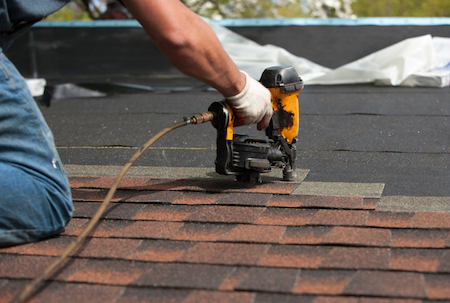 The most common residential roofing material used in the U.S., asphalt shingles are attractive and easy to install. With a life span of 20 – 25 years, they lack the longevity of more expensive materials. However, they come in a variety of colors that work well with many architectural styles, especially traditional suburban homes. And at a price of $75 to $90 per square (which covers 100 square feet), they are the most economical choice. Extremely durable and with a life span of 40 to 50 years, a clay or concrete roof is the go-to for Southwestern or Mediterranean style homes. Concrete tiles are less expensive than genuine clay, but both are very heavy and may require additional framing. At a cost of $300 to $500 per square, they add elegance at a hefty price. Offering beauty and distinction to Colonial or European chateau-style homes, slate is durable, fire-resistant and may last for as long as 100 years. Available in several colors, a slate roof will cost about $5 to $8 per square foot. At the other end of the fire-resistant spectrum, wood shingles and shake roofs are dangerous if not altogether banned in many areas. Handsome and rustic looking, they especially enhance the look of Cape Cod, Craftsman and Tudor homes. While some wood shingles are made with fie-resistant coating, the longevity of these roofs is 20-25 years. At a cost of $100 to $200 per square, they offer great aesthetics at a moderate price. But consider the life span and check local fire codes before selecting. Made of rubber, plastic or polymer, synthetic roofing materials can mimic the color, look and texture of natural materials like slate and wood. Strong and fire-resistant and at a cost of about $300 per square, they are warrantied for up to 50 years and are a choice worth considering when your budget prohibits using the natural product.